I can't help it. I'm not ready to let him go. I'm working my way through the five stages of grief and I'm at the "bargaining" point, if I keep talking, writing, and otherwise dredging up memories, I won't have to accept the fact that Paul Newman really died last Friday. Here's an excerpt from my book, Meet Me at the Butterfly Tree: "Fairhope's real center for me was next door to that photographer. The Fairhope Theater faced Fairhope Avenue at the corner of Church Stret. Family films ran every day. There was a 3:15 P.M. show Monday through Friday for the school crowd, and Mr. Summerlin, the owner, mailed a printed calendar to everyone in town every month. We could then plan our moviegoing schedules for a month in advance. I probably attended movies two or three times a week after school, usually with friends in tow. "My attachment to movies was stronger than most. This was brought home to me many years later in a recollection told me by Linda Horne, whose parents were well-known intellectuals in town. Linda said her mother had not been exposed to movies as a girl and always felt she was missing something as a result. She didn't want to deny this world to her children, so she didn't discourage Linda when I would invite her to go to a movie with me. "There were times when Linda and I would take the Greyhound bus to Mobile, see a movie at a big downtown theater within walking distance of the bus station, and then get the next bus home, chatting about movies all the way there and back. 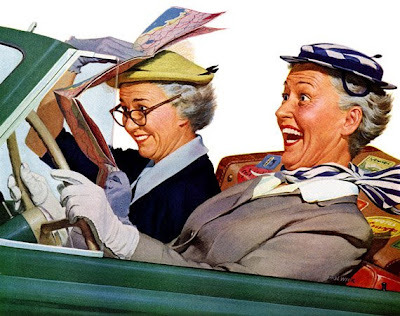 "Years later Linda, driving home to Housatonic, Connecticut, from Boston, saw an attractive, middle-aged couple in intense conversation, walking along a roadside path. They looked familiar to her, and she kept saying to herself, 'I know those people; they're friends of Mary Lois's,' but she couldn't place them. Try as she might, their names didn't come to her. "As she pulled into her driveway she remembered the names of my 'friends': Paul Newman and Joanne Woodward." The sense that the couple was accessible and interesting as people permeated the whole country. My first husband, convinced I was going to be a movie star one day, used to ask, "And will we have Paul Newman and Joanne Woodward over for dinner some times?" When I was in the newspaper game in NYC in the 70's I used to have lunch with a guy who loved theatre and movies too. His claim to fame was having seen the Broadway production of Picnic the night the understudy for the lead stepped in to take on the role (that would have been young Paul Newman). Joanne Woodward understudied Millie (but didn't go on that night). Theatre history anyway. I'll get used to the idea that he's gone. These things take time. I still stop surfing when The Long Hot Summer is on and he's telling Joanne, "All right then, run, lady, and you keep on running. Buy yourself a bus ticket and disappear. Change your name, dye your hair, get lost--and then maybe, just maybe, you're gonna be safe from me," nailing her with those blue eyes, and I melt right down to my toes, the same way I did when I first saw the movie at the age of 18. I'm looking forward to the replay of his whole body of work on Turner Classic Movies and when they run out, there is still DVD rental. I'm sorry I didn't become a movie star so that I could could count him as a friend. But I am among the many people in the world who held him in a secret compartment in their hearts. He hasn't left yet. 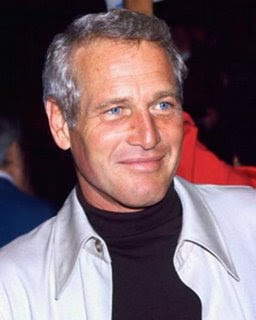 Paul Newman was iconic in the world of a teenage girl growing up in the 1950s. Handsome and playful, he was everything a movie star should be. Later he would prove himself to be a serious man with an extraordinary life in more ways. Interestingly, he attributed much of his success to luck, the luck of being born an American gifted with looks, talent and money. We who followed his life know that he also had the inherent gifts of intelligence and a strong social conscience. I received one of those round-robin emails several months ago, one of those sent to dozens of lists of women-friends, this one with the charming story--perhaps apocryphal--of Newman and the lady in the ice cream parlor. I ran it with more thoughts of mine on the man and his career, on his birthday of this year. I recommend you click on this and spend a little time thinking about the life of the wonderful man. Let us add our own wishes of hope and sympathy for his widow, his children, and his legions of friends. Vacation? No More! I'm Home! When I first moved here, a friend from Fairhope asked me how it felt to be living in such a different place. "It feels like I'm on a vacation," I responded after giving it a little thought. "I'm having a nice time, learning my way around, but at heart I still feel I'm on a vacation." I wondered what it would take for Hoboken to feel real to me. I thought about the differences--many--between this town and the last place I lived. I liked the newness, but pondered whether or not I'd ever just walk down the street and run into somebody I knew and take it for granted. Then last weekend, exploring my new neighborhood, it happened. Maybe not for the first time--the first time was when I ran into Cristina at King's Supermarket, the downtown one. I occasionally shop there on Thursdays, when my Medicare card will get me pricey groceries at a discount. She lives not far from there, so when I saw her and we spoke, not pre-arranged or anticipated, I realized that was probably the first time that had happened to me in Hoboken. The second time was when I saw a casual acquaintance, Johnson Chu, on Washington and 10th talking on his cell phone. He lit up--it doesn't take much to light Johnson up--and said, "Hi, Mary Lois!" He even put the cell caller on hold for about 30 seconds while he exchanged pleasantries with me. This is such an ordinary-type occurence in life that it's rather odd that I even took note of it. But I did, because it was a first in Hoboken. I told Johnson I was exploring my new neighborhood. Then I went home to my new apartment, feeling like an old-timer in Hoboken. The next day I heard someone call my name and it was my friend Alex, coming out of the physical therapist's after routine treatment for his pulled muscle. So it's now happened three times, and this isn't the last. I got an email from the producer of the play The Flora Dora Girls Sewing Circle of Hoboken, and she tells me I have a part after all. I'm going to be the narrator. Save the date: October 19, at the Hoboken Museum. I'm going to be meeting a lot more people. By the way, I don't look like either of those vacationers above. That was a long time ago, and I was much older then. Before: You remember how this place looked when I moved in? I was concerned that the paint didn't come out the same color as the chip, the rooms were small, and I had so much stuff that I'd just have to get rid of it all. After: Well, then I moved the furniture in and it did fit. In fact, it looked just fine in the smaller space. That wall of shelves, while looking a little like a library or a gift shop, surrounds me with the things I've collected for fifty years, including pictures of myself in various incarnations of my previous days. I was even able to get pictures up that had been in the closets for years, including a nonobjective my life's greatest friend, who unfortunately didn't live to see it in a place of honor on the wall above my new sectional sofa. The painting looks better than I even thought it would, and the fact that she spelled her name wrong on the signature makes me laugh a little almost in the way she could in life. So I'm almost all done, most all boxes unpacked and put into corners, cabinets and actual closets in the little new place. It doesn't seem as much like a garret in Paris as the last place, although it's one flight higher and 200 sq. ft. smaller. It's quirky and cozy and I think it's just right for me. No big parties here--I figure I could probably serve six people, counting myself--but I'm no longer the partygiver I once was. My daughter says she'll take some of the exotic cooking supplies off my hands. The kitchen, for one thing has no work space to speak of and nowhere near the storage I'm accustomed to for the mountains of appliances, odd-shaped pans, bowls, and dishes. It's rejuvenating in a way, to see that I won't be baking bread (Hoboken is full of bakeries), and I don't need three pie plates and nine cake pans, one, never used, in the shape of a valentine. I'll keep the custard cups, the pans for sticky toffee pudding, and the ring mold for God only knows what (I used to do a mean salmon mousse). But I'm enjoying being a kid starting out again. I wonder what will happen next! I had been invited to be on a panel at the reunion of the anarchists' school. The reunion was in New Brunswick, on the campus of Rutgers, and I had to figure out how to get there by 11 A.M. yesterday, emerging from the chaos of a newly-moved-into apartment, at an address not quite as accessible to the PATH station and Hoboken Terminal. First of all, I am not an anarchist, although having met them I somehow wish I were. The anarchist's school has been defunct for many years, located in a community that is almost nonexistent now. I was on the panel because of my involvement with my own school, a radical progressive institution from the utopian community of Fairhope, Alabama. The Modern School, whose reunion I attended, was a similar institution, and I had a lot to say to them. But I had to get there first. This meant a dry run to the Terminal for information a couple of days in advance. I love the Hoboken train terminal--it's like a vacation in Europe, except that I have a better grasp of the language. The big trains stand like circus elephants awaiting their entrance to the big top, huffing and wheezing and making train sounds before they speed down the tracks to all parts of the state. There is an information office where you can be assured you'll have to wait your turn, but you get to hear a lot of talk in that distinct regional accent that inevitably brings a smile. Then you ask your question, get detailed but not 100 per cent clear answers and a train schedule you hope will make more sense when you have time to study it. Okay, I got my info and was ready to ramble yesterday. I had no idea, even with the complex explanations and printed logs, how long the trip would take. I decided to leave the apartment at 7:30 A.M. to get the shuttle to the station and hop on the first train to Secaucus. I was correct to leave that early, since apparently the shuttle doesn't run on Saturday, or at least it didn't during the 40 minutes I waited. Thinking I could also get the #126 bus that comes down Willow, I hung in there until I realized to keep to my schedule I was going to have to take that taxi that had just let someone off a block away. I got to the Terminal--back in Paris or Florence again--and bought a ticket. The ticket agent told me the train I wanted would leave from Track 4, but I did ask as I boarded, "Does this train go to Secaucus?" It left right on schedule, and I decided I was in Switzerland again. The terminal in Secaucus is large, beautiful, and empty, at least at 8:15 on a Saturday. I had a 35-minute wait for the train to New Brunswick, but I was still feeling pretty good about having navigated so well so far. The rest of the trip was easy but a bit long, and I was beginning to wish I had brought a book with me. It was a tedious ride with many stops, and from Secaucus I was on a double-decker train that was totally full. When I got to New Brunswick I had the challenge of finding the campus. From the train I could see buildings that looked for all the world like a major university, and across from the station was a shop with the sign "Rutgers Bookstore." I figured if that was the bookstore, the college must be walking distance. I went in and got directions from the man behind the counter. "Go under that bridge to Somerset, take a right to College Avenue and a left on College Avenue." Sounds easy, but of course when you're on College Avenue there's a lot of college on your right and I had no idea where to find the building. It was already ten o'clock and I wanted to check in soon so the anarchists would know I was there. I asked a student and she pointed as if that would lead to the right building. I followed the way she pointed and discovered I was wrong, so I went back out to College Avenue. I could give you more details, but let us just say I did find the building, had a cup of coffee and a bran muffin before the meeting, met with the anarchists, and even met Perdita Buchan, author of Utopia, New Jersey, a book that inspired my second book about Fairhope, the soon-to-be-published The Fair Hope of Heaven/A Hundred Years after Utopia. Perdita drove me to the station, and after a 45-minute wait I got on the crowded train to Secaucus. Luckily the next train to Hoboken was 25 minutes late so I made the connection. When I got home I took the bus to Ninth Street and made it in time for the block party where I found some new friends and had a glass of wine and some excellent nibbles of food. It was a day full of adventures, small and large, and I learned a lot about The Modern School, the citizens of Stelton, New Jersey, and the democratic school movement. More about all that another day. Let us just say for now that there is more to New Jersey than meets the eye, or than can be seen from a passing train. I may have mentioned that I didn't think I was quite up to the roles in Flora Dora Girls. I might have been able to pull it off, but even I could see it would have been miscasting. This is the New York market of actresses, and I was among about 20 called back for nine roles. I read for two of them, an ex-stripper and the rejected uptight sister of the lead character. I'm always pretty good at rejected uptight sisters, but I had a wonderful time reading those ex-stripper lines. But this time I was reading against a roomful of the genuine article. The two roles I read were Italian-American older ladies. All the women in the room reading for those roles had black curly hair, brown eyes, and attitude to spare. I overcame my natural soft-spoken, modulated Southern accent to speak as shrilly and with the best New Jersey accent I could manage, but I wasn't fooling anyone. Every woman in the room had that kind of voice and that accent, for real. It was as if I'd moved to Dublin and auditioned for a local production of Dancing at Lughnasa. I did the play in Alabama, but my accent would probably not pass muster in Ireland, although I might have a better shot than with this production because there is no doubt I am of Irish extraction. I'm here to tell ya that Flora Dora Girls is going to be great fun to watch, and that it'll be a hit in Hoboken. I'll keep you up to date as we get closer to the time, and maybe we can all meet there for a laugh. There are a lot of old-Hoboken jokes, On the Waterfront jokes, and probably a Frank Sinatra joke or two. Here's what my rejection email said, "We were looking for a specific dynamic and look for the characters, I'm regretfully writing to let you know we did not select you for the cast of 'Flora Dora Girls'. We think you are super fabulous and a wonderful actress so continue to come back for Gaia auditions. We would like to work with you for our future productions at Gaia so please do come back!" I'll be back, girl friends. I'll be back. Neumann Leathers is an old warehouse that is used for artists' studios, right at the southern border of Hoboken, near the tracks. Last night there was a call-back audition for The Flora Dora Girls, a play by Louis La Russo II, a Hoboken native who knew whereof he wrote. I went to the first audition with a one-minute monologue from The Subject Was Roses, a speech where Nettie, the mother, describes her first dates with the Irish salesman-type who was to become her husband. They had asked for a monologue, the script was handy, and the character seemed to be similar to the descriptions in the play. The only thing that had worried me was the accent. I rehearsed it at home, trying on a Hoboken accent, and was amazed. With that accent, suddenly Nettie made more sense to me than she ever had. I found I could do something close to the right sounds, which amazed me even more. To see me at work on this monologue, click here. I read with apparent ease the first time, struggling in my mind only with the accent, and was called back to the big audition last night. Flora Dora Girls is about a group of blue-collar Hoboken women, in the 60's, who come together for a weekly sewing circle. It's the one place where they don't have to be "ladies." They sew, gossip, drink coffee, laugh, cry, ask big questions, tell great stories, but most of all bond~like a fist! We are looking for an amazingly special group of women for the original cast. This wonderful play, will be read and work-shopped for the very first time at the Hoboken Museum and Cultural Center, part of the Hoboken Studio Artists Tour on October 19th, 2008. There are ten women in the play, every one a strong, dynamic character, ranging in age from 15 to somewhere in their sixties. At the audition I was surrounded by such women, New York actress all, most looking to be Italian, all with instantly recognizable trained Broadway-belter voices. The script is bawdy and hilarious, and just being there was wicked fun. The people of Hoboken will love this. I can't wait to see what happens--and don't worry, if I don't get a part, I'll be in the audience! I'm all moved in and everything is neatly put away. How nice to have a spanking clean apartment with everything in its place! You may recognize the decor as I have carefully found a place for everything and all my treasures are delicately displayed. I had a lot to do, but the new apartment has built-in shelving in the tidy little living room, so as I unpacked I placed a few of my collectibles and pictures of myself from previous incarnations in well-arranged groupings on the shelves. Somehow it gave me the idea I might think of opening some sort of boutique as my visitors will undoubtably think they have walked into a high-end gift shop by mistake. Too bad all the closets are already full, and although I have almost no clothes, they have yet to be sorted out and there are no more places to put them. In a matter of minutes I'll have all this tucked away, the debris carted off, and I'll have a chic little dinner party for all my friends. I do hope you'll be able to join us. Moving day was stressful, hectic, and in a weird way, kinda fun. I'm now ensconced in my new place, which, as the mover said, "Is nicer, but smaller" than the last. Cartons are piled to the ceiling in every room. The new bed came but assembly is required, so I'm on the new mattress on the floor until I have the energy to unbox and assemble (or find someone who will). In the meantime, I can't find the telephone so I went to the store and bought a new one. It will take 15 or so hours to charge. I am connected only by an unreliable cell phone--which I don't know how to operate all the time--and now I finally found my laptop and its connection, so I'm checking my email. I like my new neighborhood but don't have the stamina to explore yet. Too much to unpack and remove. I had a message on my cell yesterday afternoon from Macy's deliveryman, "Since you're not home you'll have to call Customer Service to set up another delivery date." This, after waiting around for him to deliver a new sofa amidst the chaos! But never mind, it will be at least a week before that room is empty enough for a new sofa. When I have time I'm going to post on "Stuff," meaning all the things in those boxes. How do we get to this place, I wonder, when the amount of stuff is overwhelming and the fact that you've kept so much of it for so many years that you don't know why you ever wanted it. I've got great stuff, I love it. But need it? Maybe, until it comes time to move again. I think I'll stay on here until they drag me out--but that's what I said at the last place. I stayed on the bus, sleeping through Texas, rather than prolonging the trip by getting off and finding a place to stay at that point. As the bus heaved into Louisiana I did enjoy seeing familiar Southern scenery--marshes, bayous, and Spanish moss. I was getting toward home. I spent the night in a nice town, had one of the best breakfasts in my life, enhanced by the comfort of a small-town diner, with people chatting and behaving for all the world as if they were going to stay together and stay the same on into time immemorial. Being in their company made me feel everything was going to be all right. America was still small towns, contented people, and love. The name of the town escapes me for the moment, but maybe I’ll remember it soon. Most of it was washed away a few years later in Katrina, but those people at the breakfast restaurant are still there; I know they are. It was a sobering trip. I was glad to be home. People wonder what has changed now that everybody is saying that the world has changed. This is it: I have. The props were knocked out from under me and I am not the same person that went to that art show and heard jazz in San Francisco. Everything I do is tinged with the memory of that tragedy and knowledge that although we survived this should not have happened, and that it happened because of mistakes our leaders had made, mistakes for which our whole country is responsible. The Day the World Stood Still…and 43 of Hoboken's residents died. I got a call from my daughter that morning saying for me to turn on my tv. As I watched in horror…the second plane slammed into the other building. Looking at my clock it was 9:11 A.M. How strange I thought that was also on Sept 18th I had to go to a party in the Elks Club. I stayed in a hotel in Jersey City on the top floor overlooking the World Trade Center. It was at night so I could not see anything. That morning I opened my curtains and saw the unbelievable, the sight of mass destruction right before my eyes. Knowing no one could ever survive that, the next day I SAT DOWN AND WROTE A POEM. They will always remain with us. Today, seven years later, we hold memorial services and remember lost loved ones and honor the courage of the rescuers, many of whom in turn gave their lives. It was a moment in time when we were called upon to be our best selves, and by doing so we have proved our worth. If only a greater good than that could come of this, a commitment to an ever-broadening view of the world and our responsibility to this vision. Everything is almost ready at this end. The painters should be at the other end, slapping a little color on the walls as directed by me. In short, I'm moving Friday. Movers have been engaged, City Hall has been notified to clear parking spaces, telephone, electricity, and cable tv are poised to transfer service at the given moment. I even ordered furniture that will be delivered amidst the turmoil of the move. Curtain up! Speaking of the theatre, which I admit we weren't, to add to the hysteria, this evening I shall audition for a local production of a heretofore unproduced play that takes place in the Hoboken of the 1960s. I'm brushing up my New Jersey accent. I'll let you know how that goes. In the meantime, of course, I'm obsessed with packing. After having gotten rid of most of my furniture and the little vases, pictures, decorations, and memorabilia that cluttered my life as most others before I relocated to Hoboken December 1 2007, I'm getting rid of much of the rest of it. It is anything but easy, and there is nobody else who can do it for me. Still I am trolling the streets for abandoned cartons. Today I shall purchase five or six more, and continue putting books, dishes, pots and pans into them, trying to organize and label so I can find when unpacking starts in a few days some seven blocks away. The new apartment is a one-bedroom condo I'll be renting for anywhere from two to ten years, depending on how things go. It is smaller than here, but with more amenities. It is not so convenient to the PATH trains, but in a good neighborhood on a pretty street. It is a fourth floor walkup, while this one is only three. Why would I do that? Well, This apartment is really more steps--a 12-step steep stoop, while each of the flights is 17 steps. In the new place the stoop is only about six steps and the flights upstairs are broken by landings. I haven't counted the steps, but I can tell you this, the halls are pretty and the building is better managed. There is a working intercom system (none here) and fresh carpeting on the stairs (none here). I'll miss my view of the sun setting over Jersey City, but other compensations, like having a dishwasher and a washer-dryer in the basement (none here) will more than make up for it. And it's like starting over. Most of my makeshift old furniture won't fit, so I'll buy some newer, nicer furniture that does. I'll design to my own taste. I love doing that. I'll have to adjust to the new kitchen, which is as tiny as any I've ever cooked in, but tiny isn't necessarily bad. Size matters, but bigger isn't necessarily better. I'm looking forward to building a compact little life in a place that has a happy, young vibe. Wish me luck. And come up and see me some time! The third day of the four-day Italian Festival was wiped out by the tropical storm known as Hanna. This meant the procession was postponed until this afternoon at 2, at St. Francis Church, known as "The Little Church with the Big Heart." "If you could get down to 3rd. & Jefferson around 1p.m. I think you would enjoy the spectacle. Guarantee you've never seen anything like it. Beats San Gianaro. (the saint, not the feast). "Go home, relax, come to the river around 4p.m. have a sausage sangwitch & follow the saint home to 3rd. & Jefferson @ around 7p.m. Remember they're Italian.........it's AROUND 7p.m. Nothing starts on time. But get there & watch the procession & listen to all the Italian. Watch all the kissing. Very few speak English. They have a Don (not Mafia) from Italy. This year he wants to do the benediction bi-lingualy because so many old Italians are dying out & being replaced with Americans." I just returned from the first part of the festivities. I found the church, easy to do, but did not know what to expect, except that it probably would not start on time, according to my informant. A crowd had gathered, all looking like locals who knew and loved each other, old men, babies, moms, dads and neighbors. They looked at the church expectantly as we waited in the hot sun for something to happen. About 15 minutes into the wait, a little parade started, somewhere over by the A & P, I would reckon. We heard a little band playing a tune, and then some people in uniforms started toward us with banners proclaiming the holiday. There was a group of about eight or nine little girls aged nine or ten, dressed in beautiful blue capes. An old man near me said, "There used to be hundreds of those little girls in blue." From then on things went along on schedule. I still didn't know what I was looking for and the glare was so bright I couldn't see what my camera was getting. But at the end of the procession was a band of older men, playing something that sounded like "Maryland My Maryland" but probably wasn't. We waited while all looked at the church. suddenly the church bells rang, a curtain was opened, and the old men started playing music. As soon as the music started fireworks went off in the parking lot across the street and you couldn't hear anything. But the glorious statue of Mary was carried out of the church and down the street, and for some reason I can't explain there were tears in my eyes. I got a few pictures but I didn't know of what until I came home. I share them with you here and promise you this is a lovely and moving tradition. You don't have to be Italian or even Catholic to respond to it. In an hour or so I'm going down to get one of those sangwiches. I got there as soon as I could yesterday, but my stomach was growling and I promised my inner child I could have something Italian, including gelato or a cannoli. The feast was not yet crowded and I walked among the booths looking for just the right thing. At St. Ann's I had seen lasagna and I thought ziti with cheese, but I was being cautious about what I ate and had saved my calories for the famous zeppoli. Last night there was neither lasagna or ziti, but fried mutz, mutz on a stick, the fragrance of onions browning, sweet and hot sausage sauteeing, calzones in a deep fryer. I decided to have a salad to start. (Talk about being an idiot!) It was mostly celery with a little mutz, a few olives, with a couple of weak-sister tomatoes thrown in for color. I gave it up halfway through and went for a sausage sandwich and a cannoli. Walking around among all those Italians and the smell of the food I kept imagining I was hearing "Uncle Junior" from The Sopranos, crotchety and complaining about the food either in a nursing home, a hospital, or jail, I don't remember which, saying one of my favorite lines from the series, "I don't want this! We taught the world how to eat!" 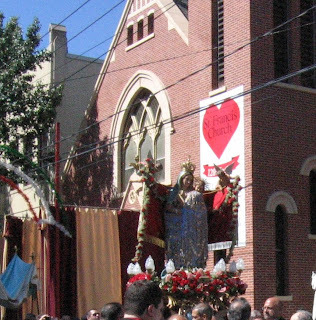 My friend "Downtown Chick" tells me the big day is when they have the procession, carrying the Madonna from the church to the feast. It was scheduled for today, but ironically there is the weather forecast for a tropical storm to hit late in the day today. The weather must have followed me from Lower Alabama. (Today when I went outside it was in the low 80's with 100 per cent humidity. It felt like home to me, like stepping up to my eyeballs into a bowl of soup.) After the hurricane leaves we'll have fall sure enough, and everybody will feel wonderful, even without an Italian feast. About this time a year ago I let it be known I was leaving Lower Alabama for New Jersey. I wanted to be close to Manhattan and closer to my daughter and her two sons who live in Kingston, NY. Hoboken, I told them. It was the place I had chosen. My stepdaughter, an artist who lives in the wilds near Grants, New Mexico, responded, "Really? Hoboken? Soprano country!" Not subscribing to HBO I had missed the award-winning series, but to be au courant I rented the first episode at one point and watched it from my treadmill. I was impressed, but it wasn't my thing. That was the only episode I had seen. That was then. Now I watch re-runs on A & E every day at 3 P.M. Sometimes I catch an episode on the weekend. For a while it was hit-and-miss (not hit or miss, but and), because I was catching episodes out of sequence. I stayed confused. "They're gonna whack this one," and "Hey hadn't they killed him by this time?" I look for telltale locales, but I can't say that much if any of it was shot in Hoboken. 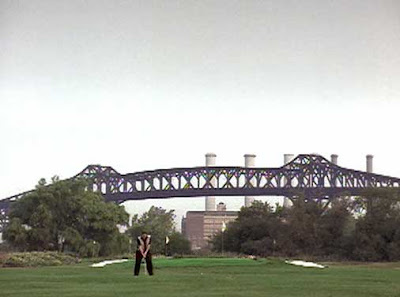 I recognize all that stuff in Weehawken at the sign-on, when Tony is chewing that cigar as he comes out of the tunnel and over the bridges. He drives through neighborhoods that could be Newark or Jersey City, but definitely are not Hoboken. Pizza-Land and Satriale's Meat--not Hoboken. Then he wheels down into some upscale neighborhood that could be anywhere, U.S.A., into an Italian mansion that it wouldn't take a mob boss to love. Beautiful landscaping. This could be in one of the many communities within commuting distance of New York. My readers probably know where it was filmed. Surely not Summit or Montclair. Tony and Carmella and family would not be welcome there. But in a way Hoboken is Soprano country. There is a realtor with that last name, who probably gets teased a lot, but it's her name. Nobody denies that there was a presence of the Cosa Nostra when there was a waterfront here and crime was a big factor in this part of New Jersey. My friend Slezak says they were all nice guys. (Nice to him.) Sinatra once sent "some guys from Hoboken" to break Buddy Rich's kneecaps when he was having difficulty with the drummer. And Jimmy Roselli was in-and-out with the boys most of his life. I just watched today's episode of The Sopranos. It's a superbly crafted drama, and whenever it's family and Dr. Melfi, I am totally hooked. Today A.J. (Tony Jr.) was expelled from school and Tony wanted to enroll him in a military academy. The former mob boss' son had to be extinguished, so there was a funeral scene and lots of grief and a couple of arrests at the graveside. I seem to recognize that cemetery, just off the turnpike. Dr. Melfi tries to get Tony to talk about what he wants for his children. His daughter gets drunk at the post-funeral and starts throwing bread bits at Uncle Junior, who is singing sentimental Italian songs (rather well, I thought). It's the absolute highest level of soap opera, beautifully photographed and expensively produced, with some of the most convincing ensemble acting I have ever seen. And last week one of those actors was filming a movie right in front of my house on Hudson Street! Exciting country, Soprano country.